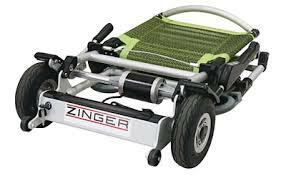 The Zinger battery powered lightweight wheelchair is fun to use. It’s small nippy and a new concept. It can be used both indoors and outside The Zinger is comfortable and it’s manoeuvrable; it can literally turn on a sixpence piece. The armrests on a zinger are optional. The basic model has no handle bar so you can use it like an ordinary chair and pull it under the desk or table to work or eat. It looks like the answer for people who have a ‘chuck it in the boot’ mentality for disability equipment. It does not look like a typical disabled person’s wheelchair. It only weighs 17.5 Kg (38 Lb) and this includes the lithium Ion battery. The dimensions when it’s open are 78.5cm long, 64.5cm wide x 93.5cm high(31″ x 25″ x 37″). It is narrow enough to pass through all but the narrowest of doors. Most doors are 83.5 cm (33”) wide. 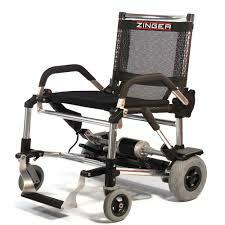 The Zinger wheelchair is made of aluminium so it is light and strong. You control it with two simple joysticks, one on each side of the chair: pull up to stop or turn/ push down to go. All well and good but you do need to have good upper body strength and full control of your arms. The wheels are not large, especially the front wheels. Some dropped kerbs do have a 1cm drop, alright to go down but not so easy to go up. The rechargeable battery is simple to remove. You have the option to recharge it in position on the chair if you wish. A full charge takes three and a half hours and, once charged, the Zinger can zip about for up to 8 miles. The distance will depend upon the terrain and weight of the user. The maximum weight of the user is 120kg (17st 12lbs). The wheelchair can be folded up and put into the boot of a car or carried onto a train. It folds up like one of those chairs you use at a BBQ. The dimensions when folded are (L x W x H): 95.5cm x 64.5cm x 25cm (38″ x 25″ x 10″). Like all lightweight disability devices with small wheels it will not go off-piste unless the ground is hard and flat. So pavements, shopping malls and garden parties in the summer are good to go. Wet lawns, gravel drives and muddy puddles are definitely no-go areas. The compact design and its simple folding mechanism makes this electric wheelchair truly portable and easy to transport in the boot of an average sized car. I have never owned a Zinger, my weapon of destruction is a Travelscoot. There are so many factors to consider when buying a mobility aid such as a scooter or wheelchair. The most important is to talk to existing users and discuss such aspects as ease of repair, servicing, cost and availability of knowledgeable agents. The zinger is made in taywan and the quallaty is excellent i have one very happy interesting it has no gearbox it works on a very simple principle hope it is right and lasting problem no proper dealer ship in Australia for service does enybody know ? Not too sure if this will help. Try typing “zinger wheelchair AND australia” into a search engine such as Google chrome and look at the results. is the zinger chair zr-10-a still manufactured? Hi Patrick, I tried the Zinger at home and tested it directly against the Foldawheel (which I purchased). The main thing about the Zinger which I didn’t like, was that it made you feel a bit exposed as your hands and arms are down at your sides operating the controls. In most other ways the Zinger and Foldawheel were very similar – weight, manoeuvrability, portability, ability to use up to and under a table or desk, battery life and cost (though the Foldawheel was a bit cheaper), quality of engineering and construction. I didn’t feel that the Zinger was as intuitive to control as the Foldawheel. I used them both at my home on the same surfaces and for the same length of time, so it was a good test. Interesting. I had not thought about the idea that the arms-rests provide a feeling of protection and feeling uncomfortable because your arms are down at your sides. I can fully understand the arm rests providing a bit more stability and security. Are you happy with the Zinger? It is quite expensive and I would like some feedback from another person with MS. Does it have a tortoise/hare speed? I don’t own a Zinger’ Looked interesting so I reviewed it. One person I know tried one out and said the lack of arm rests made him feel a bit unsafe, Therre is going to be a demo for the Matford MS group in early June. Sadly I cannot attend but I will try to get someone there to give me some feedback and publish it because there has been quite a lot of interest in the article. I have no idea where it is made. Is it possible to trial this wheelchair and I would like details of price etc. You will need to contact a Zinger agent. I’m sorry about the delay writing a reply, I’ve only just returned from a holiday.